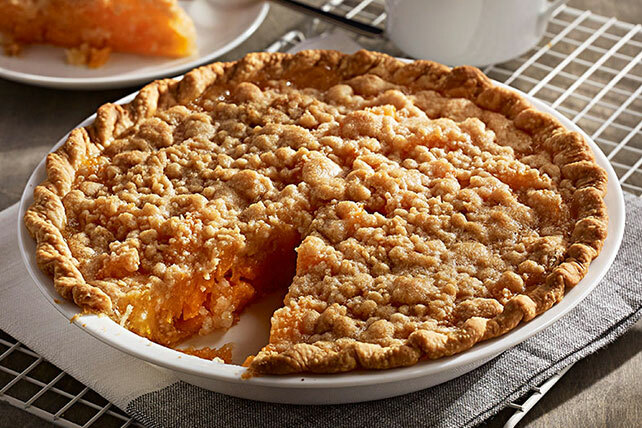 Serve up this delectable Apricot Crumble Pie for dessert tonight. This Apricot Crumble Pie includes tapioca, brown sugar and fresh apricots. Toss apricots with granulated sugar and tapioca. Let stand 15 min. Mix flour and brown sugar in medium bowl. Cut in butter until mixture resembles coarse crumbs; set aside. Prepare pie crust as directed on package for unfilled 1-crust pie, using 9-inch pie plate. Fill with apricot mixture; top with crumb mixture. Bake 45 to 50 min. or until juices form bubbles that burst slowly. Cool.